WATERPROOF Ammo Cans to keep your outdoor gear dry and protected! Stock up! These waterproof .30 cal. Ammo Cans were once used by our troops. A gasket on top keeps them waterproof and airtight. They're perfect for ammo and reloading tools, gun-cleaning accessories and more. Fold-down handle on top for easy carrying. Condition: used, in very good shape; minor surface rust on some due to long-term storage. A little WD-40 makes them look great. Satisfaction guaranteed. Order ONLINE Today! Each waterproof, steel Can measures 3 3/4 x 11 x 7 1/4inches and weighs 46 ozs. Easily holds 5 boxes of 20-ga. shells. Ammo can's are referenced/named/sold by the size of the can, not labeling. We can not select by labeling. 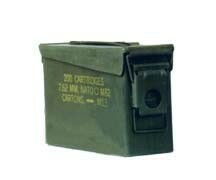 For example "30 Caliber" is the size of the ammo can, not how it is labeled. Ammo Can labeling does vary. The can may be labeld, but isn't not limit to: 30 cal, caps, tracer, blanks, explosives, ordinance. The label may be painted over with any color of spray paint to hide the label (Black, Red, White, Olive being popular colors). They may have been relabeled or marked with a pen. There may be duct tape on the can.